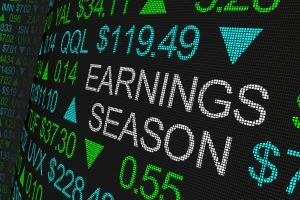 Financials kicked off first quarter earnings season and five of the six biggest banks have reported mix results, with an underlying spin of optimism that the US remain in good shape. Shares of JP Morgan, Citigroup, and BlackRock are higher following results, while Wells Fargo and Bank of America are trading lower. JP Morgan: The US economy continues to grow, employment and wages are going up, inflation is moderate, financial markets are healthy and consumer and business confidence remains strong. Citigroup: On the consumer side, in North America, we expect continued year-over-year revenue growth with US Branded Cards now on a solid path. Bank of America: Economic growth and consumer activity in the U.S. continue to be solid, businesses of every size are borrowing and driving the economy, and asset quality is strong. Goldman Sachs: Ongoing geopolitical risks, including the US-China trade and Brexit negotiations added uncertainty. Notwithstanding the mix backdrop, resilient macro fundamentals and rising asset prices spurred client engagement later in the quarter. Blackrock: “We have a risk of a melt-up, not a meltdown here. Despite where the markets are in equities, we have not seen money being put to work. In general, financials are indicating the US economy remains in good shape and despite a cloudy outlook that is uncertain due to risks to economic activity that come from geopolitical events. Some banks, such as JP Morgan and Citigroup appear better positioned for loan growth along their solid balance sheets. Price action on the S&P 500 index shows the recent rally may be overextended and could be ripe for a pullback. The longer-term bullish trend could hold, if initial support from the $2,800-$2,835 level holds. A break below $2,800 could target $2,766.